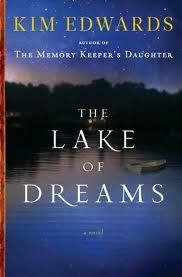 The Lake of Dreams, by Kim Edwards. Published By Penguin Books Australia, RRP $29.95. Sleepless one night, Lucy makes a momentous discovery. Locked in a moonlit window seat is a collection of family heirlooms – objects whose secrets no one was ever supposed to find. Piecing together her family’s true history, she realises that the story she has always been told was a fiction…Mesmerising and haunting, The Lake of Dreams is a startling story of family secrets and lies, lost love and redemption, and of the many pieces and puzzles that make up a life. 1. In what ways did the success of Memory Keeper’s Daughter make writing your new novel easier? Well, I learned a great deal about novel writing from the experience, and I took that knowledge with me into “The Lake of Dreams.” Also, hearing from so many readers, and having such a positive response to the novel here and in many other countries, was both exciting and affirming. I felt a great freedom writing The Lake of Dreams. 2. In what ways did it make it harder? Making the transition from the very public act of touring to the very private act of writing was difficult at first. It took me a few months to regain some tranquility. Fortunately, I’d begun The Lake of Dreams well before The Memory Keeper’s Daughter was even published, and I was glad to get back to the story. 3. Where did the idea for the story come from? 4. Early on you have your main character, Lucy, wonder, “could the past ever be just the past?” I’ll ask you the same: can the past ever be just the past? 5. Secrets play a role in both your novels. Why are you drawn to secrets? 6. In what ways were you shaped as a writer by your family history? 7. You grew up in the Finger Lakes region of upstate New York. In what ways did you draw on that experience as you wrote the book? 8. How does teaching at the college level help your writing, and vice-versa? It’s very helpful. Of course, the writing I do informs my teaching. My classes usually focus strongly on revision, an essential skill for writers. At various times in the writing of both novels I used writing exercises that I assign to students to help me explore my characters more deeply. If you loved Memory Keepers Daughter then you won’t want to miss reading Lake of Dreams – put it on your Christmas wish list now!